Fire Safety Supply provides Fire Suppression Servicing for Northern California. Our full line of fire suppression servicing began in 1998. We offer all types of services from installation of new systems to repair and semi-annual and annual maintenance. Our technicians are factory trained. 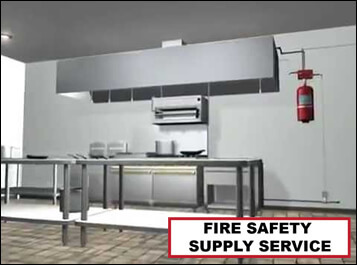 Fire Safety Supply can handle all of your pre-engineered restaurant suppression needs. We offer design, installation, inspection, system drawing and maintenance services for your Ansul, PyroChem and Amerex fire systems and extinguishers. We are here for you when it’s time to install a new Ansul or Amerex fire suppression system. Most Restaurant and Commercial Kitchen Fire Protective Systems are Automatic Fire Suppression Systems installed directly over the commercial cooking equipment. This is true in Kitchens like the KITCHEN KNIGHT II Fire Suppression System (See Kitchen Knight II Video Below – More Videos? Click Here!) which is installed within the large Exhaust Hoods. This is used to extract the hot oil and grease fumes produced during meal preparation. Due to the continued exposure of hot oils and grease moving through the exhaust fan, the Kitchen’s Fire System can quickly become coated with oils and grease. Over time clogging and sometimes a complete blockage of the systems spray nozzles which can cause a reduction or stoppage of the nozzles ability to release the Extinguishing Agent. This is evident when the fire suppression system is activated by the heat of a fire and will greatly hinder the system’s ability to eliminate the fire possibly causing large amounts of unnecessary damage or a loss of your building. Fire Safety Supply Services are here to help Restaurant, Mobile Commercial Kitchen, Food Truck and Concession Stand Business Owners with the NFPA-12, 13, 17A & UL 300 Commercial Kitchen Fire Suppression System Inspections, Maintenance, Testing and Compliance Certification. Whether your facility is a privately owned restaurant, part of a nationwide restaurant chain, or a commercial or institutional kitchen operation, we will provide expert services to help keep you protected and compliant with current codes and standards.